I love weekends off because that means more time to play around in the kitchen. I have had these Praline Rolo Cups from Very Culinary saved on my FoodGawker account for months but never found the time to make them (and had no idea what a praline was. Seriously.). There’s only 4 ingredients, which makes these bite-sized desserts incredibly easy to make. 2. In medium sized bowl, mix together dough, pecans, and toffee pieces until well incorporated. 3. 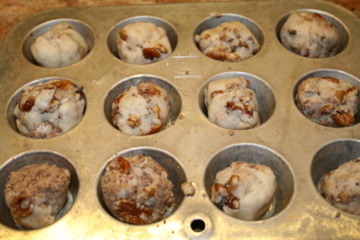 Form small balls of dough and place each into a greased mini muffin pan. 5. 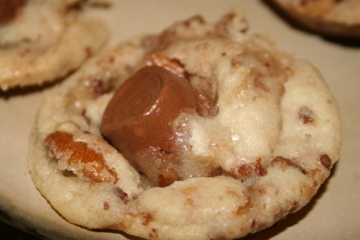 Immediately place one rolo candy into the center of each cookie. The centers will sink due to heat. 6. Carefully fold in edges to make the cup. 7. Let cool completely before you attempt to take them out of the pan, or they will fall apart. Here’s what the cookies will look like if you forget to fold them. They still taste delicious though! !